It’s difficult to codify something like Avengers: Infinity War (2018) without including everything that led up to it. In reality, it’s probably more along the lines of the 19th episode of a television series that’s taken ten years to realize fully. Because of the interconnected nature of these previous movies, it’s difficult to view it alone without the backstory tied to it. However, there are enough brief moments of exposition to help most people fill in the gaps as to what is happening. Still, as is the case with many finales for television shows, the epic nature of Infinity War is at a level all its own. 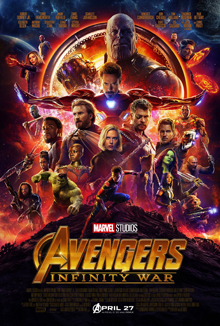 The scale of such an endeavor is daunting, but with as little backstory as possible holding it back, Infinity War moves at a pretty good pace, jumping between a couple of groups of Avengers. Of course, we can’t just directly jump to fighting the main villain, so the “lesser” bad guys stand in the way for a moment, but mostly fill time until the penultimate battles. At least during this waiting period, we get to learn the motivations of the heretofore mostly mysterious Thanos (Josh Brolin), which ends up humanizing this terrifying villain who thinks he’s doing the right thing. While the action is probably a little too shaky at times, the team-ups are what sell this movie. No longer are there coy little cameos and winking nods to references from other Marvel films (although, there is a somewhat shocking cameo about half-way through), but instead full-blown connections that expertly ties up the disparate parts of the 18 previous films. With an ending as shocking as this one, I’m a little curious where Marvel goes from here, but I have my hunches about what the future will bring. An ambitious project that deftly delivers on its many promises, I give Avengers: Infinity War 4.5 stars out of 5.